What Causes Leaky Gut? You’ll be Shocked! Discussions of this syndrome are indeed surprising since most “conventional medicine” doctors don’t “believe in” leaky gut. Discussions of this syndrome actually really, truly surprise me. To read that not all “conventional medicine” doctors “believe in this” makes me think “WHAT?” It’s not as if we’re asking them to believe in the Tooth Fairy, though. In reality, we can test for leaky gut. We can heal it with specific leaky gut supplements and diets. We can see maladies and diseases caused by leaky gut go away when we fix the gut problem. The question of what causes leaky gut is slightly controversial. In fact, there are shocking factors regarding causative “agents” which I’ll reveal in this article. But first, let me answer an increasingly common question: “What is leaky gut syndrome?” I have included references so the leaky gut naysayers can understand this disorder is not just real, but a lot more common than one might think. Leaky gut syndrome is a gastrointestinal condition that occurs due to intestinal tight junction (zonulin) malfunction. These “intestinal tight junctions” act as the guardians between your intestines and your bloodstream. Your GI tight junctions keep “bad” things out of your bloodstream. It makes perfect sense why you wouldn’t want undigested food particles, toxins, allergens and bacteria spilling into your bloodstream from leaky junctions, doesn’t it? If you have leaky gut, the inevitable happens—bad things get through the gates. As a result, inflammation occurs throughout your body leading to a variety of diseases. What Diseases are Linked to a Leaky Gut? If you have developed food sensitivities, then (foods which trigger any/all GI symptoms, headaches, fatigue or rashes) you might need to fix your gut immediately. To clarify, I’m not talking about food allergies which are IgE-mediated events such as hives and throat tightening. I’m talking about IgG-mediated food sensitivities; most commonly experienced when eating gluten, dairy, eggs, citrus, or other “odd” foods, and not commonly known to be allergy-causing foods such as peanuts, for instance. Leaky gut may morph into a full-blown auto-immune inflammatory bowel disorder such as ulcerative colitis or Crohn’s. If you have one of these disorders, this article may help you find your triggers. In fact, all autoimmune diseases have leaky gut as their root cause. When you heal the gut, you start to have the ability to reverse the symptoms of many autoimmune disorders. This might be “news to you” but if you find yourself here and you’re taking a “biologic,” do know there’s a safer, better way to get into remission. Indeed, this includes Type I diabetes which is, of course, an auto-immune disorder. Any and all skin rashes including (auto-immune) psoriasis and eczema have been linked to leaky gut. In addition, autism and mood disorders have been associated with leaky gut and show a response when the leaky gut is treated. I have put several references to this in the final section. My colleague, Dr. Mark Hyman has a good deal of experience in this area, with superb results. As I tell you what causes leaky gut, think about your habits. It is my personal belief this problem is rampant. I would have never believed that I would develop this issue, but I did, as you’ll read about in the “shocking” section of this article. Recall the discussion above about food sensitivities? Certainly, the food you eat can cause leaky gut. Increasingly, GMO-gluten used ubiquitously in our food supply is being blamed for non-celiac gluten sensitivity and leaky gut. It’s estimated 25% of Americans have some type of food sensitivity. However, that doesn’t even account for those people who consume the “standard American diet” (SAD). Consuming GMO foods, additives, artificial sweeteners and the “ginormous” amount of sugar in our typical diet is indeed enough to make most guts leak. Add in non-sprouted grains and lectins, and you have the perfect gut storm. To explain, lectins are substances found mainly in beans which can irritate the gut lining in susceptible people. Excessive caffeine and alcohol make the situation worse and in some cases, are the cause of leaky gut. To point out, so far we have only discussed food and beverages. 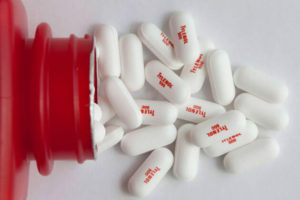 Painkillers are probably the most commonly over-used gut irritant available. Your tight junctions can be nuked by everything from ibuprofen to Vioxx to Tylenol. Antibiotics upset the balance of good to bad bacteria which can cause “the leak.” Proton pump inhibitors (PPI’s), used for heartburn (Prevacid, Protonix, Nexium), are death to GI lining cells. Other non-bioidentical hormone medications such as steroids (prednisone, medrol) or even birth control pills can help feed yeast, which can also damage the gut lining. Lastly, chemotherapy medications significantly disrupt the gastrointestinal balance (dysbiosis), causing many cases of small-bowel bacterial overgrowth and leaky gut. Dysbiosis of the gut means the GI microbiome is out of whack. Your GI microbiome is the bacterial environment in your gut which is crucial for optimal GI function, immune function, and even brain function. Organisms such as yeast (candida) can invade the lining of the intestinal wall and break down “the gates.” Other organisms such as giardia (a parasite), Helicobacter pylori (responsible for ulcers) and more have the ability to irritate the intestinal lining leading to gastrointestinal symptoms and leaky gut. Exposure to chronic stress means chronically elevated levels of cortisol. High cortisol can lead to a breakdown of your GI lining. It does this by slowing down both down digestion and peristalsis (GI motility). As a result, blood flow decreases to digestive organs producing a higher concentration of toxic metabolites which then whittle away at your gut lining. Environmental chemicals deplete our reserves of protective minerals, which can lead to leaky GI cells. Further, there are direct GI toxins such as the fluoride in our water, or the mercury in our waterways and many fish we eat which are also contributing factors. Now, hang onto your hats for what you’re about to read because it affects all of us to some degree. Definitive evidence that dust mites can harm us via non-allergic mechanisms has been proved beyond a shadow of a doubt. Dust mites can act as intestinal parasites, causing GI tract pain and diarrhea. They can also act as “irritants,” causing measurable, definitive leaky gut; with or without GI symptoms. Those of you who are aware of “our story” about why we got mold in our home (construction and HVAC defects) and then what ensued may be surprised to hear about the diagnosis of what caused my leaky gut and then subsequent Crohn’s with full-fledged mitochondrial dysfunction. The cause was dust mites; not mycotoxins, but dust mites. If you are wondering, I have put my mitochondria back on the way to health and my Crohn’s in remission. Notably, all without toxic drugs of course. Now, back to the dust mites and mold issue. Mold does increase your chances of having dust mites because dust mites eat all sorts of gross things, including mold. 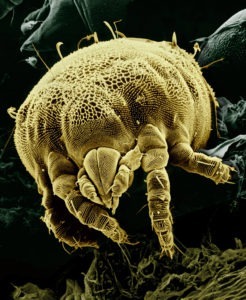 So, if you see visible dust or you have pets, or you have any other risk factors for leaky gut, I suggest you read the linked article on dust mites and get these critters out of your home! If you have food intolerances, you can do a full panel of IgG testing for food intolerances, especially gluten intolerance testing. To check for gut leakiness, you can do a lactulose/mannitol test. This is a highly specific test that analyzes the urine for two sugars, mannitol and lactulose; looking for the typical “leaky gut pattern” post-ingestion. Finally, a good Functional Medicine Physician who treats Leaky gut syndrome can often make the diagnosis with a good history and physical. Treatment involves first, removing gluten, dairy, sugar, and processed foods from your diet. During the first 8 weeks, it’s necessary to avoid caffeine and alcohol, as well. I also instruct my patients to avoid lectins and nightshade vegetables (eggplants, peppers, and tomatoes) for the first 8 weeks. Further, any pharmaceuticals which can be eliminated should indeed be removed from the picture. Next, we examine your “toxin situation” and address it. We also do the same with cortisol and potential dysbiosis, too. We then heal the gut lining and re-populate it with good bacteria. Specifically, this is achieved using probiotics. If there is yeast, we also get rid of it. If there are “bad bugs,” we get rid of those too. In detail, the exact “how to’s” are outlined in the articles linked at the beginning of this article. However, you can type “gut” in the search bar at the bottom of this page, and you’ll find what you need. With this in mind, also read the dust mite removal article to find my all-natural cleaning formulas. 2. The Role for Gut Permeability in the Pathogenesis of Type 1 Diabetes – A Solid or Leaky Concept? Pediatr Diabetes. 2015 Nov; 16(7): 485–492. 3. The brain-gut axis dysfunctions and hypersensitivity to food antigens in the etiopathogenesis of schizophrenia. Karakuła-Juchnowicz H, Dzikowski M, Pelczarska A, Dzikowska I, Juchnowicz D.
4. Impaired Intestinal Permeability Contributes to Ongoing Bowel Symptoms in Patients With Inflammatory Bowel Disease and Mucosal Healing. 5. Zonulin and its regulation of intestinal barrier function: the biological door to inflammation, autoimmunity, and cancer. World J Gastroenterol. 2014 Aug 7; 20(29): 9942–9951. Author contributions: Samsam M wrote the paper; Ahangari R contributed to writing and data finding; Naser SA analyzed the data and gave direction. 8. Presence of commensal house dust mite allergen in human gastrointestinal tract: a potential contributor to intestinal barrier dysfunction. Parasit Vectors. 2014; 7: 411. 10. House dust mite: a new player in intestinal inflammation? Wildenberg ME, van den Brink GR.